Background: Oatmeal’s filling rep goes all the way back to medieval Scotland where it was the staple food for the soldiers. Nowadays, kids are brought up on the brown packets of sugar-loaded oatmeal. While it may seem more convenient to buy individual packets, it is actually just as easy to prepare oats from bulk and cheaper too! Worried about losing flavor? We have some ideas to make sure your oats satisfy your morning taste buds! Oatmeal is an example of a whole grain. Generally, 1/2 cup of uncooked regular oats or 1/4 cup of uncooked steel cut oats supplies about 150 calories, 3 grams fat, 0g saturated fat, 1 g sugar and 5g protein. 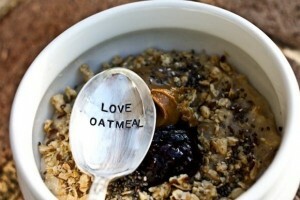 Oatmeal’s main nutrition claim-to-fame is its heart-healthy amount of soluble fiber. Not only is soluble fiber good for lowering cholesterol, it is also what gives oatmeal its filling power. Unless fortified, you’ll need to add some fruit for your dose of vitamins. There are three main types of oats you can purchase: rolled, quick/instant, and steel-cut. No matter what kind you choose, the healthiest option is to buy original oats so you’re in control of added sugar. By buying oatmeal in bulk you will also save yourself a lot of money! If you Google how to cook oats, you will come up with more ways than you’ll know what to do with, so here are just a couple ways I’ve tried and liked! 2. Put ½ cup of oats in saucepan with ¾ cups water. Cook at medium heat for 5 minutes or until it reaches desired consistency. 2. Put ½ cup oats in a saucepan with ¾ cup water. Cook at medium heat for 2 minutes or until it reaches desired consistency. NOTE: Steel cut oats save very well, so make a big batch on Sunday and reheat throughout the week!